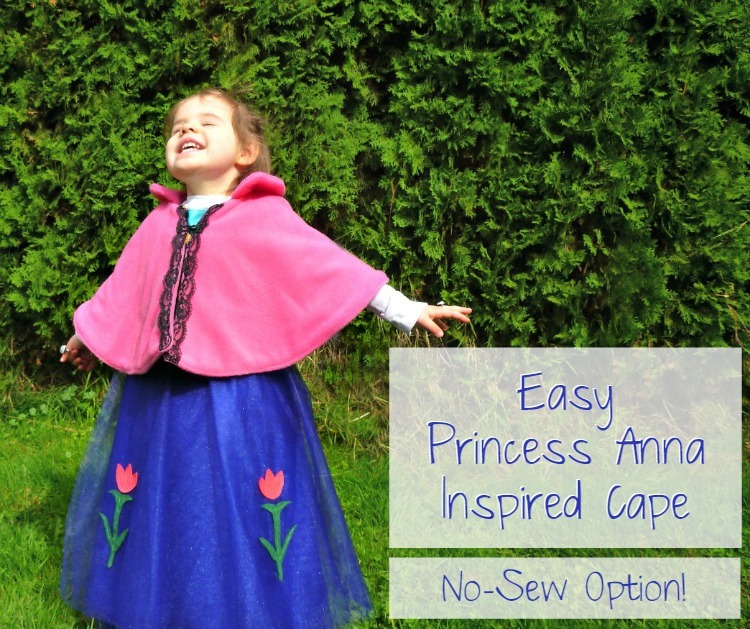 This Princess Anna Cape was so quick and easy, it makes the perfect DIY cape for kids. We’ve made many dress up costumes and share our free patterns and proven beginner sewing tutorials to walk you through it step-by-step. If you sew, it takes less than 2 hours. 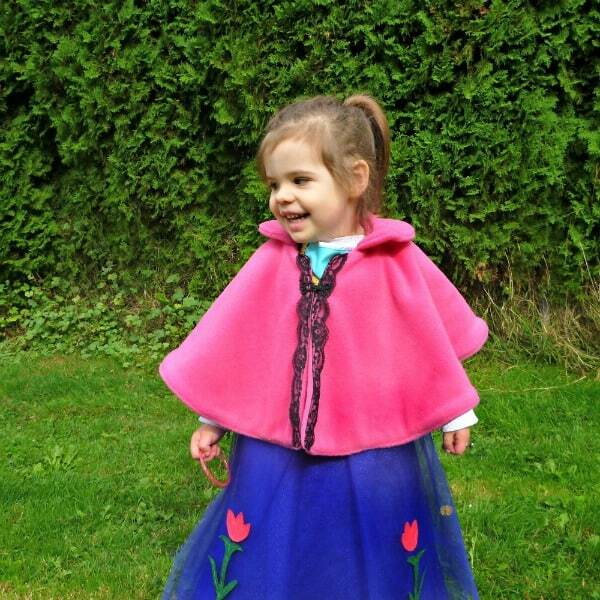 If you don’t sew or are just looking to add an element to a Princess Anna Halloween costume, you can just make a single layer fleece cape without a collar and it will take you 10 minutes. No kidding, people. Come on in and read this one. This might come as a surprise to you, but it’s cold and rainy a lot here in Seattle in the fall and winter months. Newsflash, right? Anyway, it’s cold and rainy and fleece is cheap, so I am making some accessories for some of the munchkin’s dress up costumes. Whether trick-or-treating for Halloween or just traipsing about Disney (or the grocery) in the fall or winter, our happy-go-lucky little Princess Anna will be prepared with a caplet to accompany her Princess Anna dress up apron. Check out the new bling: an Anna ring and a pink ‘big girl’ bracelet! Since you’re here now and we want you to come back when we post new dress up tutorials, we invite you to sign up for our once-weekly email newsletter. One of the best parts is that all of our newsletter friends gain access to a super-secret, members-only section of Ruffles and Rain Boots! Take your creativity to the next level and sign up for our newsletter. If you don’t sew or are looking for something to whip up quickly, this is gonna be so stinkin’ easy, your head will spin! Step 1: Fold fleece into a 4 layer square and cut out the circle. Start at the corner where all layers join and use chalk (or pins) to mark 2.5 inches down. Leaving the tape measure at the join point, move the tape measure to the right and mark again at 2.5. Repeat until you arch across the corner. Step 1 (part 2): When you finish the top “circle,” measure down your desired length. For my daughter, I chose 19 inches but you could make a full-length cape or one just a bit longer than this arm-length one. The sky is the limit! Once you have your starting measurement (from the corner where all layers join), follow the same steps as above, using the tape measure and chalk as a compass. You’re basically making 1/4 of the circle and when you cut, it will be through all layers! Step 2: Cut on the outside of the marks or pins – just below your measurements. You can easily shorten it if it is too long but you can’t easily add length – that’s just a good rule of sewing, Y’all. Step 3: Slit one side of the circle open and add a fastener (you could glue on Velcro or ties or sew on a button). Because fleece doesn’t fray, it’s ridiculously simple! Oh and you’re totally done; there are no more steps. Quick and painless, right? You could add some lace (sold by the yard at JoAnn’s or other craft stores) with some glue or even add some pompom trim around the bottom. The amount of fleece you will need will depend on the size cape you want. To get your fabric requirements, measure from the neck to the desired length and read through the tutorial to see how that length will determine your fabric amounts. If you’re making this for an adult you might have to attach two pieces of fabric together (but that can be done with minimal hand sewing or glue). I bought the materials before I sketched out a design and I overbought (1.25 yards) raspberry fleece ($8.99 without a coupon). It’s a good thing, too, because I raided the supply before making this cape ‘cuz I was in desperate need of pink fleece for our Tic Tac Toss game. 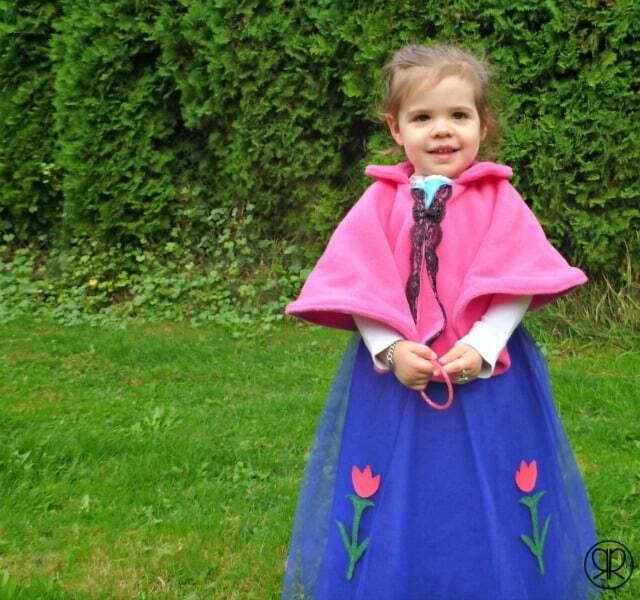 This Princess Anna cape took less than 2 hours to cut and sew. It was surprisingly simple because its design is based on a circle skirt. Easy peasy, lemon squeezy. Here’s the little one caught in mid-twirl (not the best face, but you can see the cape). Here are my photos from following the tutorial for the “no-sew” option above, with just a few changes (listed after the pictures). I used fleece for both the outer fabric and the lining because it’s cheap and fuzzy. The kidlet seems to like anything fuzzy or anything that even looks like it might be fuzzy. Porcupines don’t look fuzzy to meper se, but the nugget thinks they’re adorable and she thinks they could use a hug. I added a covered hook and eye closure so my kid could easily get it on and off herself ‘cuz I don’t want to have the responsibility. As an added bonus, because she can fasten and unfasten it herself, Elise wore it on our walk this morning to get (even more) veggies for our stock. The collar pattern came from here if you’re inclined to add one. It looks adorable either way. The pompom trim. Wait, you don’t see any pompom trim? Yes and that’s because I am 4-inches short of trim. I ended up using it on this 20-minute infinity scarf. So that’s the whole thing – cute, right? 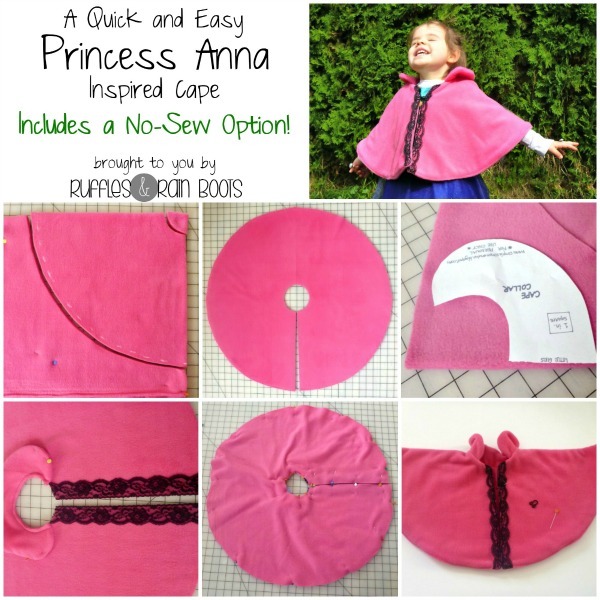 I can’t believe how easy this Princess Anna cape was. Elise sure had a great time “testing” the cape! Perhaps you would like to share this with your followers and Pin the image below to Pinterest so others can experience this look of pure bliss? 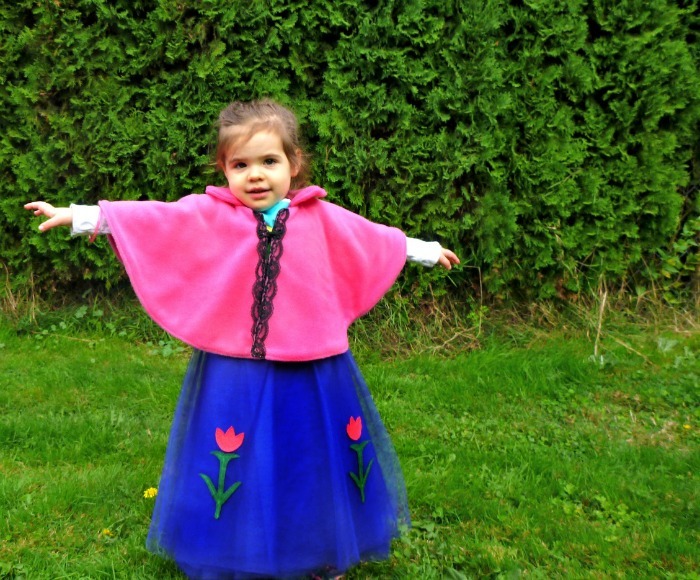 This Princess Anna Cape was so quick and easy, it makes the perfect DIY cape for kids. Fold fleece into a 4 layer square and cut out the circle. Start at the corner where all layers join and use chalk (or pins) to mark 2.5 inches down. Leaving the tape measure at the join point, move the tape measure to the right and mark again at 2.5. Repeat until you arch across the corner. When you finish the top "circle," measure down your desired length. For my daughter, I chose 19 inches but you could make a full-length cape or one just a bit longer than this arm-length one. The sky is the limit! Once you have your starting measurement (from the corner where all layers join), follow the same steps as above, using the tape measure and chalk as a compass. You're basically making 1/4 of the circle and when you cut, it will be through all layers! Cut on the outside of the marks or pins - just below your measurements. You can easily shorten it if it is too long but you can't easily add length. Slit one side of the circle open and add a fastener (you could glue on Velcro or ties or sew on a button). I’m making one today, but only have a yard of fabric. If I was trying to replicate exactly what you did, how much fabric would I need? I am at the step where I have folded it into quarters and the 2.5 inch mark has been drawn, but after that I no longer have 19 inches of space? Have I done something incorrectly here? One yard of fabric would only yield an 18-inch long cape because you’re folding the yard (36 inches) in half. For my daughter’s cape, I had 1 1/4 yards, so I had a bit more to work with. You can make an adorable caplet at 18 inches, though. I hope you were able to finish yours. If you need a longer cape, more material would be required (or the addition of a ‘skirted bottom’ might look quite nice with fabric attached to the inside bottom of your cape). I’m confused. Is there a link to the sewing tutorial? The no-sew option says something about reading through the tutorial to see how the length of fabric will impact the length of the cape, but I can’t read that on this page and I don’t see a link to a full tutorial. what am I missing? Scroll down and the full tutorial is below the no-sew tutorial. It tells you how to measure for the length of the circle (I shared what I used – 19 inches – but wanted to make sure people knew they had options). Thanks for sharing! We live where it is cold and we need to add a cape for warmth! Can you tell me how fabric you ended up using? I saw you said the 1.25 yards was too much. I have 2 yards, and I am hoping to make a long and a short cape. My daughter is about a size 5/6. Any recommendations? Brenda, I would say it depends on the length you’re wanting. If you’re looking for a short cape, 1/2 a yard would work. I’d probably pick up 2/3 of a yard to make sure you can create the circle / collar. Good luck! Thank you so much, Tanya! I’m so thankful you all thought it was a good project. I’ll be at the party again this week. This is darling! And your model is oh so cute! Thanks for sharing! I wish I could shew! It is wonderful! Very cute and very special! Love this cape and she is so adorable!! Stopping by from Sew Crafty Angel’s Wake Up Wednesday Linky Party. 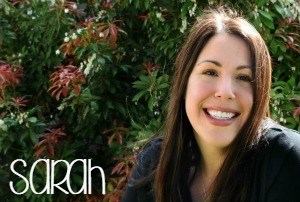 I am love your blog!!! Alisha S. invites you to read Wake Up Wednesday Linky Party #19 and Giveaway!! Oh, Alisha thank you so much for the kind words and I appreciate you stopping by from the party! 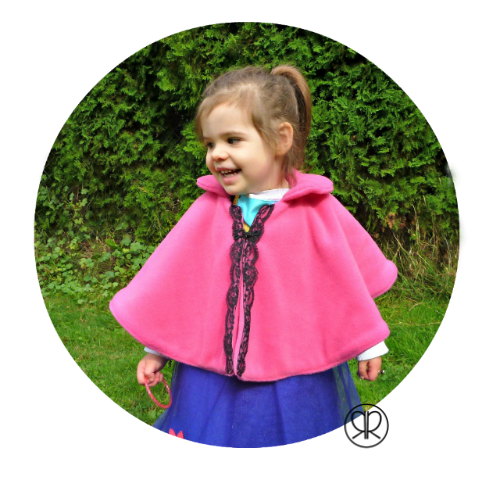 This is adorable…makes me wish I had a little girl to make one for..I am sure my 19 year old son would not be a fan of a pretty cape! Thank you so much for sharing with us at Party in Your PJs. Thank you so much for the party, Kim! See you next week. You have the most beautiful model! So excited to find you on Crafty Allie’s link up party!! This is amazing. I pinned it to a few different boards and I would also like to invite to my weekly link up and join the fun! This would be great to share with everyone! Thank you for the Pins, Jessica and I’ll definitely link up at the party. Thanks, Jess. You could make her a no-sew version so quickly. And I’ll admit it’s daunting to start sewing, but with so many great tutorials on the web, it’s fairly easily to start producing quickly. Thanks for stopping by today. Aw. I love this! My daughter loves all things Frozen. Amber invites you to read Hey, It’s Okay Tuesday! Isn’t it how amazing FROZEN resonates with the little ones? Thanks for coming by today, Amber! This is gorgeous and of course Elise looks adorable! Thanks so much, Heather! It was entirely too easy because of their tutorial – I want to make another one for a friend’s daughter! This is so cute and is perfect for the chilly Halloween night we usually have! I would love it if you would share a post on my Meet Up Monday Blog Party! super cute and she is probably the best dress veggie picker out there :) Pinned! Would love if you stopped by our Snickerdoodle Sunday sometime! You are so great at whipping these things up. I’m inspired! I think I figured out how to add the cape/train to Elsa’s dress. I still have to sew the darn thing but I’ll let you know if my bright idea pans out. This really is easy and cute!! Grandma just bought the 6 year old a Princess Anna Halloween dress and now we can make it complete with this cape!! This is so cute! You are so talented.